We had a very long holiday in the beginning of May. Six days off from work. Too bad it’s over now, and going back to work seems harder than ever. The vision of our June vacation is still very blurry, but it helps me get through the first working days. But let me tell you about this cheesecake. The first thing that you should know is that a good cheesecake is the ultimate dessert for me. I love making it, I love sharing it and I absolutely love eating it. And that’s a baked cheesecake I am talking about. 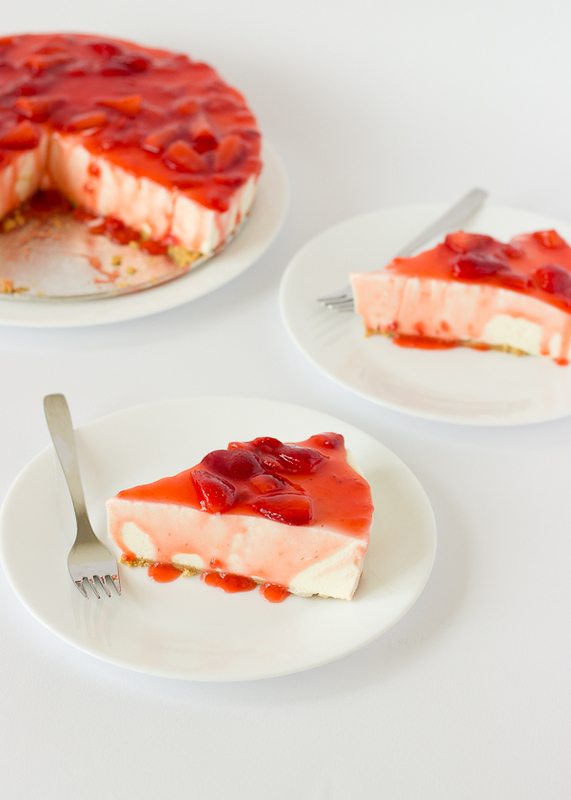 I have never made a no-bake cheesecake. Until last week. Somehow I needed to try a no-bake version, I just needed to know the difference. Just to make it a little gentler on my waistline and healthier, I sweetened it only using honey. I also added lemon zest because I like lemons, a lot. The verdict: it’s a whole other dessert and it has nothing in common with the baked version. It is good but it really gives the word cheesecake a whole new meaning. It is light, soft and refreshing. 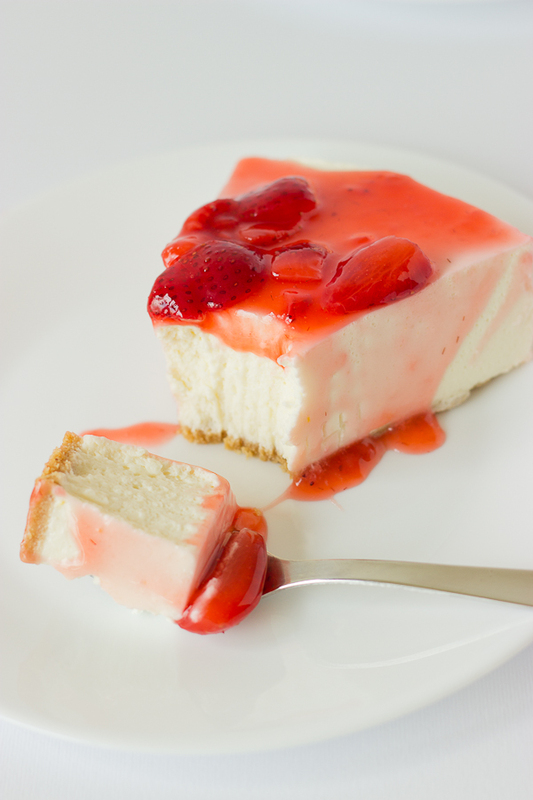 While the classic cheesecake evokes the image of a warm, busy bistro in a rainy, chilly day, its no-bake brother screams sunny, June, late afternoon. I dare you to try and see for yourself. Me? I definitely love it! 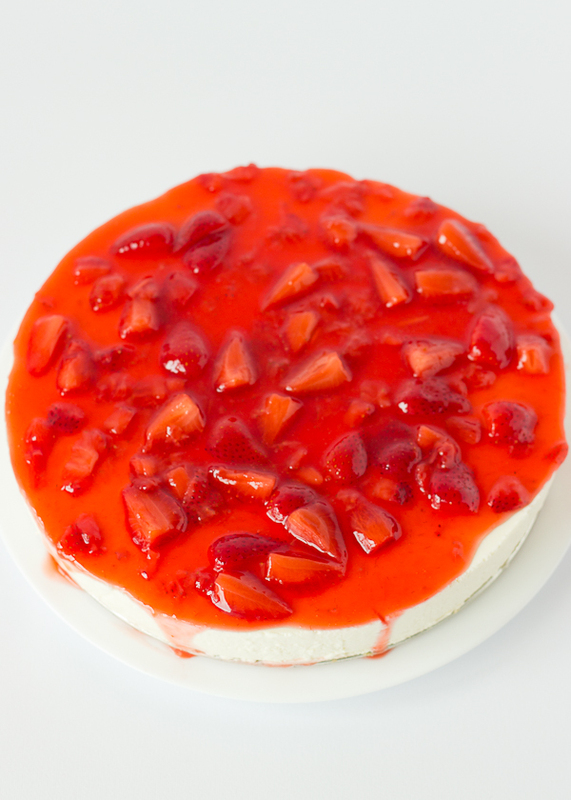 But I need a new name for it, because it is nothing like a classic cheesecake. 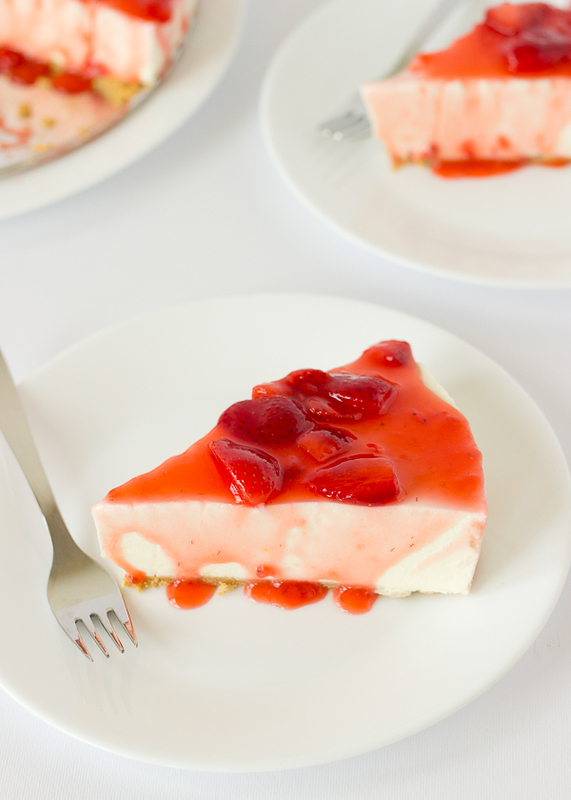 A no-bake cheesecake with a hint of lemon,sweetened with honey. Garnished with fresh strawberry sauce. Prepare the crust: Place the biscuits in a food processor and pulse until fine crumbs form. Add the butter and sugar and process until thoroughly mixed. Spread the biscuits evenly over the bottom of a 26 cm/10 inch spring-form pan, pressing it firmly to form the crust. Refrigerate for 30 minutes. Pour 60 ml. (1/2 cup) of the heavy cream in a small microwaveable bowl. Sprinkle the gelatin over it and let stand for 5 minutes. Microwave the gelatin on medium power on 15 seconds intervals, stirring after each one. Don’t let it boil. When the gelatin is fully dissolved, let it cool at room temperature. Place the cream cheese in a large bowl and mix with an electric mixer on low speed for a few minutes. Add the yogurt and honey and mix until incorporated. Add the gelatin-cream mixture and mix thoroughly. In a large bowl whip the remaining 1 cup of heavy cream on high until soft peaks form. Gently fold the cream into the cream cheese. Pour the filling in the pan, over the prepared crust and refrigerate overnight. For the sauce: Slice half of the strawberries into small cubes. 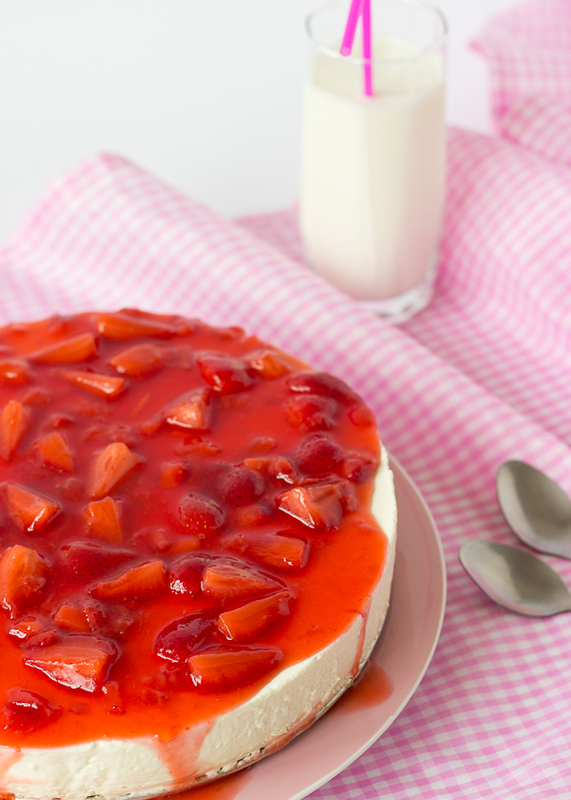 In a heavy-bottom saucepan, combine the sliced strawberries, honey, water and cornstarch and place over low heat. Stir frequently until the sauce reaches the boiling point and let it boil for 3-4 minutes to cook the starch. Slice the remaining strawberries into chinks and add them to the sauce. Cook for 2 more minutes, remove from the heat and let cool completely. Pour the sauce over the cheesecake just before serving.